Not to be confused with Egglescliffe. Eaglescliffe is a small town in the borough of Stockton-on-Tees in North East England. It is on the north bank of the River Tees and for ceremonial purposes is in County Durham. The bridge at Eaglescliffe on the border with Yarm marked the last crossing point of tidal section of the River Tees until a five-arch stone toll bridge was built in 1771 in Stockton on Tees. This bridge was replaced in 1887 by the Victoria Bridge, now a grade ll listed building. The opening of the Tees Barrage in Stockton in 1995 made the section of the Tees through Eaglescliffe non-tidal. Eaglescliffe is divided by railway lines which lead from Yarm to Stockton and can only be crossed by vehicles at the north and south of the town, although there are two pedestrian bridges and an underpass. ✪ Cab Ride Longlands Jn to Eaglescliffe. The name of the town is thought to be derived from a misspelling of the name of the nearby village of Egglescliffe meaning a church on a hill. A common myth on the name change is that in Victorian times the sign for the new railway station turned up incorrect after the signwriter thought that Egglescliffe was a mistake and altered it. Bishop Skirlaw of Durham built a stone bridge across the Tees in 1400 which still stands. An iron replacement was built in 1805, but it fell down in 1806. The Stockton and Darlington Railway passed through the grounds of Preston Hall in Eaglescliffe, and on the opening day there was a famous race between a stagecoach travelling down Yarm Road, and the Locomotion No. 1. In 2011, Eaglescliffe was named the 4th best place for families to live in England and Wales, according to the savings firm Family Investments. From the 1940s to the 1990s there was an MOD base situated at Allens West in Eaglescliffe. After World War II the base was Metal Reclamation Unit No 2, and was used to dismantle aircraft that were downed in the north of England. It then became the Royal Navy Spare Parts Distribution Centre (RNSPDC), and later the Royal Navy Supply Depot (RNSD) Eaglescliffe, until its closure in January 1997 as part of the 'Defence Cost Study'. The storage and distribution functions were transferred to Portsmouth Naval Base, and the procurement function to MOD's site at Abbey Wood, Bristol. At its height, the Depot employed more than 2,000 staff and had a significant influence on the local economy. This later reduced to around 750 just prior to closure in 1997. Part of the former MOD site is now the Urlay Nook Admiralty ecology park, the rest of the site was sold to a Distribution company in 1997. Aerial photographs show that the site used to have railway sidings and a small runway. A masterplan has been drawn up to build up to 1000 homes, a 5000m2 care home, 500m2 of community facilities, and up to 1000m2 of retail space on the site. A map of Eaglescliffe showing main roads and estates. Eaglescliffe adjoins a small village called Egglescliffe, and legend says that the name Eaglescliffe came about when a mistake was made on the railway station's sign. The village lies in the civil parish of Egglescliffe, as does Urlay Nook, to the west. The north part of Eaglescliffe, to the west of the A135, lies within the parish of Preston-on-Tees. Several housing estates combine to form Eaglescliffe including Millfield, Kingsmead, Sunningdale, Hunters Green and Orchard Estate. The main road through the town is the A135 Yarm Road which was part of the old route of the A19 until the 1970s when it was diverted near Thornaby-on-Tees to the east. 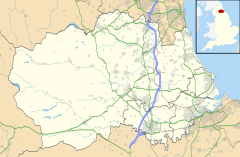 Nearby towns include Stockton-On-Tees and Middlesbrough to the north and north-east and Darlington to the west. Many events are held in Eaglescliffe every year, mostly in Preston Park which is situated to the north of the town on the Tees. Many of these events are run by Stockton Council. Preston Hall museum in Eaglescliffe. Many local groups gather at the community centres and village halls within Eaglescliffe and its neighbouring village, Egglescliffe. Egglescliffe Community Centre is the largest, and plays host to two amateur dramatics groups – Cliffe Theatre (who produce at least two plays every year), and Centre Stage (who produce a pantomime every January, as well as a musical every summer). Egglescliffe Community Centre also hosts many other community groups including a Ladies Section, a weight loss group, dance classes, and many others. Within Eaglescliffe, sited on Yarm Road, is Eaglescliffe Golf Club – a course which occupies the land on the eastern side of Eaglescliffe bordered to the south by the Sunningdale Estate, to the north by Teesside High School, and to the east by the River Tees. Many street names in the Sunningdale Estate, as well as the name of the local 'Links Primary School', reflect the location of this golf club. Eaglescliffe has one secondary school called Egglescliffe School. This is in the east of the town. There are also four primary schools: Junction Farm, Durham Lane, The Links, and Preston. Egglescliffe village has a primary school called Egglescliffe CofE Primary School. As well as these there is also Teesside High School, an independent preparatory and high school, originally an all-girls school, it is now introducing boys within the framework of a diamond model of education. Tetley Tea have had their only tea bag factory in the western world here since 1969 on Sowerby Way. It is the largest tea bag factory in the world, on the Durham Lane Industrial Park, having a floor area of 220,000 square feet (20,000 m2) and makes 18 billion tea bags a year. Warburtons have a bakery outside of the village to the north-east on the Preston Farm Industrial Estate. The Elementis Chromium site in nearby Urlay Nook closed in June 2009. Eaglescliffe is part of the Stockton South Parliamentary Constituency which is represented in the House of Commons since 8 May 2017 by Dr Paul Williams (Labour), "a local GP". Eaglescliffe railway station is a staffed station. Grand Central operate five trains a day direct to/from London Kings Cross station. Northern provide local services to Darlington, Middlesbrough, Saltburn and Sunderland. Matthew Bates, defender for Hartlepool FC, raised and schooled in the area. ^ "Stockton ward population 2011". Retrieved 24 July 2015. ^ "Jobs hit as chemical plant closes". BBC News Online. BBC. 29 April 2009. Retrieved 5 December 2009. ^ "Matthew Bates". Evening Gazette. 6 September 2006.